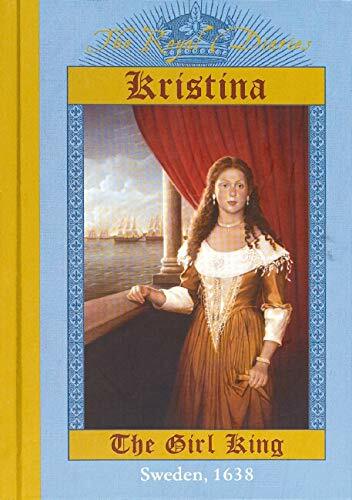 # Kristina: The Girl King, Sweden, 1638 (Royal Diaries) BOOKRING! Released on Monday, September 22, 2003 at bookring in postal release, postal release USA. Book arrived today. Thank you! I'll try to read this as soon as I can so that I can continue it on its journey. Finished reading the book last night (9/29). I liked this book much better than the Eleanor of Aquitaine book. This author does a much better job of taking the historical events and weaving them together into a good story with a strong character. I did wish, however, to get more details of some of the events. The journal entries are often too short. Released on Tuesday, September 30, 2003 at Mailed to another BookCrosser in College Station, Texas USA. Wow! This book looks great! I can't wait to read it! Thanks for the postcard, karendawn! Update 2nd Nov 2003: I'm so sorry, I haven't had the time to read this. I've been swamped with tests and assignments for the last few weeks, but I promise to start the book this week and it will be mailed to the next person on the list by next week. Sorry!! Update 8th Nov 2003: Okay, I've just finished the book and the funny thing is, although I liked the story, I found the information at the back of the book much more interesting. I really enjoyed this book and I've looking forward to reading the other books in the series! Will PM dangerouswoman3 for her address and mail it to her next wednesday! Released on Tuesday, November 18, 2003 at Another bookcrosser in Porto, Porto Portugal. Mailed to next reader dangerouswoman3 via surface mail today!! I received today this book from malaysia by mail. Kristina the last Vasa heir to the throne, was born in sweden in 1626 to the Swedish king Gustav II Adolf of sweden. What is truly remarkable for the times, the eary 1600´s , is that king Gustav decides that Kristina is going to be the next king, not the next queen.Gustav was determinated that is daughter rule sweden and not be merely a pawn in the royal marriage market of europe. Kristina herself is a rather unusual girl.Born achead of her times, she is an exceptional student and linguist. She hates sewing and other feminine pursuits.Instead she loves the outdoors and is a skilled rider and a crack shot. Of the english kristina says that " they have no culture to speak of" though she does admire queen Elizabeth I, who also ruled as her country´s king.Like Elizabeth Kristina has no interest in getting married or having children. She is determined that she, and she alone, will rule Sweden. Its so many of the young women on Euopean thrones,Kristina struggles with her lack of personal freedom. She realizes at an early age that she has very little control of her own destiny and fights against it. In the early 1650´s, Kristina renounced her crown because of her inclination to catholicism(sweden is a dominantly protestant country). I love this book because Kristina is a strong girl that win in the world of the man´s. In ours days women have to fight to grown up and win on the world of the man´s. Unfortanely he have much discrimination in this cruel world. Released on Monday, March 08, 2004 at correio in Porto, Envio Postal/Postal release Portugal. Released today by post mail.Directly to Silverstone, Sweden. I received this one some days ago. Thanks! I have already read it and enjoyed it. Being Swedish and have read about Kristina before I find it quite accurate and possible in the way she is portrayed as a child/teenager. Strong, wilful and intellectual. I have somethings I would like to check up on but I can recommend this one. I have some earlier bookrings to post before I can post this one. I am posting them one or two at a time when my finances allows it. Please have patience with me. Released at the Bus4you ticket office!